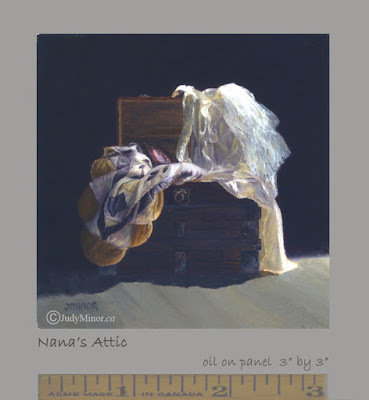 'Nana's Attic' (original miniature oil, 3" by 3") was entered into the Miniature Painters, Sculptors & Engravers Society 2016 Annual Exhibition and received First in the International Category. I hope to be making random new posts here as paintings/drawings 'surface' from the studio, or if there is something to share, writings or images, that might be enjoyable. I have also put a small slideshow (above) which shows the original paintings which are available for purchase. Details of these images may be seen on my website and/or are available by email. Prices are $95 (CDN) and up. I do accept PayPal and will ship. Just drop a line if you have any questions.